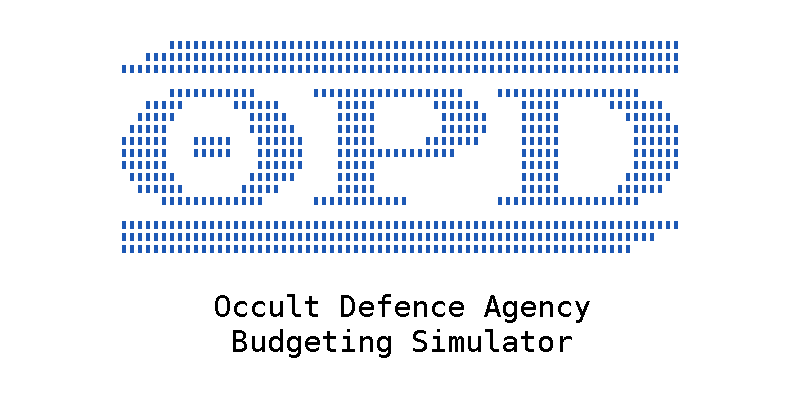 7 Dec 2018, 11:26 a.m.
Occult Defence Agency Budgeting Simulator: Defend the realm from vampires, werewolves, pixie swarms. Cut your budget mercilessly. Survive. I went into Ludum Dare straight after NaNoWriMo, on a really busy weekend. But I liked the theme: "Sacrifices must be made", so I wanted to do it. Between a bunch of social engagements, it took me three days to complete my game, but I did get there. Each Ludum Dare, I like to joke that I go through the stages of grief about the theme. Denial - Surely people wouldn't vote for that? Bargaining - Maybe if I shoehorn a completely unrelated game into the theme? Anger - People are stupid to have voted for that! Depression - I have no ideas at all. Acceptance - Well, I guess I do have an idea. This time, this natural order of things was disrupted, and I instead found myself making a matrix of different ways to interpret the theme: On one axis was whether to take the term "sacrifice" literally, mechanically, or metaphorically. The other axis was what your relationship to the sacrifice was: are you the sacrifice, or are you sacrificing? And how do you feel about it? This approach, of finding multiple axes of interpretation for the theme and considering each combination, is definitely something I will reuse. You are the employee of a company. At the end of each level, one employee gets fired. You must sabotage the other employees to make sure you get to stay. You are a willing human sacrifice. Your tribe has encountered a great calamity, and your ritual death will help them process it. You can choose the details of the ritual. Talk to the members of your tribe to find out what they should be. You are in charge of an organisation, and there are multiple rounds of budget reductions you need to deal with, while still allowing your organisation to fulfil its mission. The first idea sounds quite fun, maybe something like a PvP version of Overcooked where you sabotage each other instead of working together. But I couldn't figure out a way of doing it within the remaining time. I really like the human sacrifice idea, but I think it needs more time and attention given the subject matter. You're not just running any organisation, of course. You're running a paranormal defence agency inspired by Charles Stross' Laundry and my recent attempts at winning XCOM on hard difficulty level. It's also reminiscent of my previous Ludum Dare game Concierge, in that you have a bureaucratic job where you need to allocate things in a way that prevents disaster. So you find yourself in charge of the Office of Paranormal Defence, a minor organ of the UK government facing heavy cuts. Your new minister - resemblance to real figures definitely intended - is keen to impose austerity by repeatedly cutting your budget. Each turn plays out as a new budgetary year, as you need to decide which activities of your agency are vital, and which can be reduced or eliminated. Do you need custom werewolf holding cells? A fancy Christmas party to lift your team's spirits? An entire research department devoted to pixies? 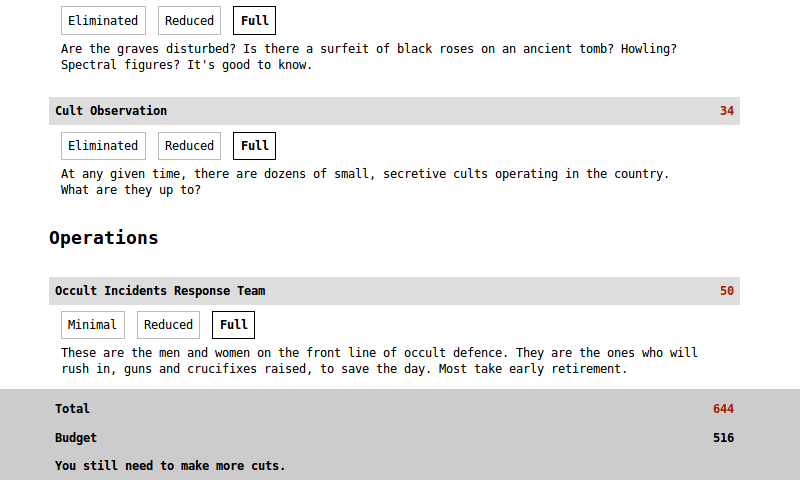 Cut the wrong things, and the UK will be devoured by occult horrors. So - no pressure! There is a good ending, really. There's also four definitely very bad endings and two ambiguous ones where you can make up your own mind as to whether you've succeeded. This is another interesting thing I've come to realize: don't explicitly label your endings as "winning" or "losing". Leave it to the player to decide! You can play the game online here and see its LDJAM entry here. Addendum about the logo: It's of course intentionally drab and horrible. I wanted to give it a real feel of a supposedly modern and dynamic but actually staid corporate-ish redesign given to a UK government agency. I was also inspired by the horrible pixelated logos you see in old bank machine screens. "OPD" stands for "Office of Paranormal Defence", and the O has a dot in it because the original logo incorporated John Dee's Monas Hieroglyphica.